Background: Genus Isodon (Lamiaceae) is a prolific source for bioactive terpenoids. Nowadays, people move towards natural products because of undesirable effects of chemotherapeutic drugs. Objective: In silico and in vitro approaches were attempted to screen bioactive terpenoids isolated from Isodon wightii with acetylcholinesterase and histone deacetylase3 receptors. 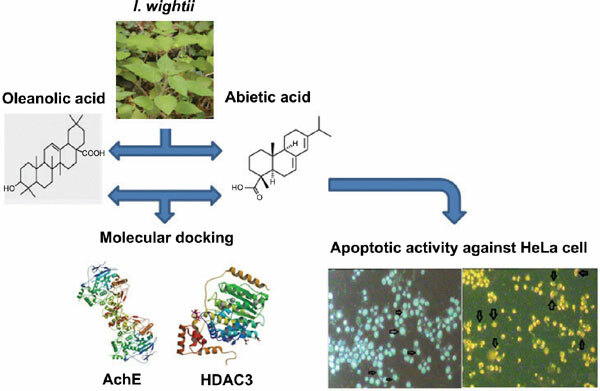 Methods: Terpenoids such as abietic acid, oleanolic acid, α-amyrin acetate, β-amyrin acetate were docked with AchE and HDAC3 receptors using AutoDock Vina (version 1.1.2). Further, GROMACS 5.1.2 package was used to perform molecular dynamic simulation. In vitro apoptosis was tested using hoechst 33258 and acridine orange/ethidium bromide. Results: Ligplot analysis indicated that abietic acid had strong binding efficiency with AchE and HDAC3 receptors forming one and four hydrogen bonds respectively. Root mean square deviation analysis showed AchE-abietic acid and HDAC3-abietic acid complexes with high deviation which later attains equilibrium around ~25000ps and ~10000ps respectively. Root mean square fluctuation study showed that the complexes have high fluctuations indicates the high flexibility of residues. Solvent accessible surface area revealed the favourable interacting region of AchE and HDAC3 receptors with abietic acid in the range of ~215nm2 to ~235nm2 and ~157nm2 to ~175nm2 respectively. Apoptosis inducing the activity of abietic acid was tested against HeLa cells. Hoechst 33258 staining showed increased apoptosis by abietic acid in a concentration-dependent manner. AO/EtBr dual staining showed early apoptosis at 25-75µg/mL and necrosis at 100-125µg/mL abietic acid. Conclusion: In silico and in vitro studies suggest that abietic acid could be a promising terpenoid for treating Alzheimer’s disease and cervical cancer. AchE, HDAC3, terpenoids, HeLa, Isodon wightii, molecular docking.